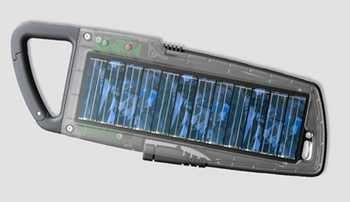 The energy alternative company Solio will release a hand-held solar battery recharger on October 15, 2007. The sleek new design is for use on virtually all electronic devices. It comes with an adaptor tip that can fit into any USB port or charge directly from the sun. The best part is the price. It will sell for less than 80 USD. The new solar hybrid rechargeable device by Solio will be released on October 15, 2007. The Solio H1000 Universal recharger is powered by small solar panels that can hold a charge for up to one year. The device is for the on-the-go back packer or anyone interested in conservation. The great news is the price. The small, sleek and handsome device sells for less than 80 USD. According to the Solio press release, the hand-held device has a universal adapter that is compatible with nearly all electronic devices. It comes ready to use right out of the box. It also comes with adjustable adaptor tips for iPod, iPhone and most MP3 players. It works on GPS devices and most cellular phones. A fully charged Solio H1000 will power a cell phone or provide 10 hours of play time for a MP3 Player. According to Solio the hand-held device solar energy storage breaks down to one hour of sunshine for 15 minutes of cell phone talk time. One hour of sunshine equals 40 minutes of MP3 music time. The alternative cable tip that fits into any USB port is also included. This allows the user to charge the device from any computer. The smart hybrid device has a 1.5 to 5 watts output. It has a 5-6 watt input capability and the Solio Hybrid 1000 measures 198 x 68 x 144 mm. The solar output is .6 watts. The total weight of the device is slightly over a pound. Solio is a company that is dedicated to finding alternative energy sources for electronic devices. The devices may be used for emergency power sources or an alternative energy source. The company has been invited to the 2007 Clinton Global Annual Meeting. Solio has been reviewed and appeared on American TV and popular electronic publications. The application for its use in energy deprived countries or rural areas makes this an exciting new device. The Solio Hybrid 1000 will go on sale October 15, 2007. The Solio Company is taking advanced orders at its web site: solio.com . (c) 2007. All rights reserved. This material may not be published, broadcast, rewritten or redistributed in whole or part without the express written permission.